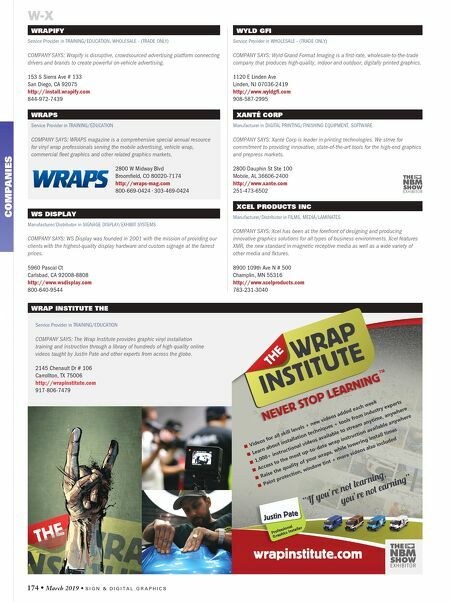 S I G N & D I G I T A L G R A P H I C S • March 2019 • 175 Z3 GRAPHICS Manufacturer/Distributor in AWNING SYSTEMS/SUPPLIES/EXTRUSIONS, SIGN COMPONENTS/ HARDWARE COMPANY SAYS: Z3 Graphics offers a full range of sign graphic products including vinyl-applied flex faces, heat transfer flex faces, vinyl-applied polycarbonate faces, commercial and residential awning systems, computer cut text and logos, vinyl rolling stripping. 250 Feaster Dr Greenville, SC 29615-6128 http://www.z3graphics.com 800-664-1093 • 864-770-0789 ZÜND AMERICA INC (SEE LISTING BELOW) ZUNI SCROLLING SIGNS Manufacturer in ELECTRONIC DIGITAL SIGNAGE COMPANY SAYS: We are committed to the growth and profitability of our clients and partners by developing the most innovative and cost-effective advertising products in the marketplace, while offering a level of service that exceeds their expectations. 5615 N 6th Ave Ozark, MO 65721-4239 http://www.zuniscrollingsigns.com 417-581-0738 XPEL TECHNOLOGIES CORP Manufacturer/Distributor in FILMS COMPANY SAYS: Our entire line of PPF and window films are hand-drawn, measured, and tested manually. Our ULTIMATE line uses special elastomeric polymer technology that allows the film to heal itself from scratches or swirl marks in a matter of minutes. 618 W Sunset Rd San Antonio, TX 78216-6907 http://www.xpel.com 210-678-3700 YARD SIGN NINJAS Manufacturer in WHOLESALE - (TRADE ONLY) COMPANY SAYS: Wholesale headquarters for yard Signs, banners, magnets and more. 6125 Valley Dr Bettendorf, IA 52722-5564 http://www.yardsignninjas.com 309-269-1000 YELLOTOOLS INC Manufacturer in SIGN & WRAP SHOP TOOLS/SUPPLIES, SIGN COMPONENTS/HARDWARE COMPANY SAYS: YelloTools is the world's largest supplier of cutters, cutting rulers, cutting mats, foil bearing systems, cleaners, etc., for people who make signs, banners, print, label vehicles, produce neon signs, process self-adhesive films and more. Wilberhofener Str 3 Windeck D-51570 GERMANY http://www.yellotools.com 714-273-3223 X-Z SDG ZÜND AMERICA INC Manufacturer in CNC ROUTERS (XYZ), DIGITAL PRINTING/FINISHING EQUIPMENT, FABRICATION & INSTALLATION EQUIPMENT, SOFTWARE COMPANY SAYS: Zünd is the world's leading manufacturer of digital cutting/finishing systems. Built for 24/7 operation and powered by Zünd Cut Center, Zünd high-performance cutters offer extensive tool and automation choices, all designed for ultimate productivity. 5068 W Ashland Way Franklin, WI 53132-8177 http://www.zund.com 414-433-0700 COMPANY PROFILE: About Zünd America: Since 2004, when it was first established in Franklin (Milwaukee), Wisconsin, Zünd America has grown from five employees and 10,000 sq. ft. to more than 60, occupying over 24,000 sq. ft. of demonstration, service, office and warehouse space. We support thousands of customers all over the U.S. and Canada, in graphics, packaging, leather, textiles/composites, manufacturing and other industries that rely on Zünd cutters for precise, efficient digital cutting. Zünd Systemtechnik AG, a family-owned business with operations worldwide, specializes in developing and manufacturing digital cutting systems. The Zünd name represents Swiss quality and is synonymous with precision, performance and reliability. 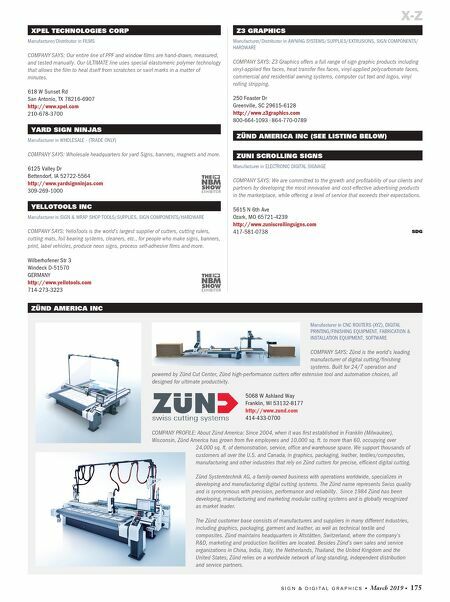 Since 1984 Zünd has been developing, manufacturing and marketing modular cutting systems and is globally recognized as market leader. The Zünd customer base consists of manufacturers and suppliers in many different industries, including graphics, packaging, garment and leather, as well as technical textile and composites. Zünd maintains headquarters in Altstätten, Switzerland, where the company's R&D, marketing and production facilities are located. Besides Zünd's own sales and service organizations in China, India, Italy, the Netherlands, Thailand, the United Kingdom and the United States, Zünd relies on a worldwide network of long-standing, independent distribution and service partners.